The quarterly magazine is excellent with articles sent in by owners, informative features on aspects of Ronart ownership, forthcoming events, test days, regalia etc. Various events, trips, meetings etc are arranged and the club is well worth joining. 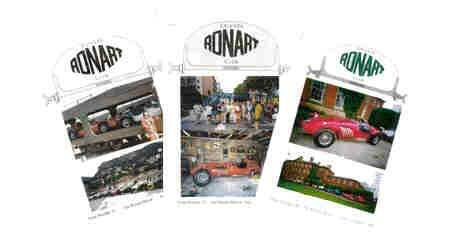 Essential if you are a Ronart driver! 1998 was the tenth anniversary of the first overseas trip of three intrepid owners driving to the Monte Carlo Grand Prix. The same three plus others met up once again on the French Riviera where a great time was had by all. The Monday after the Grand Prix saw us getting up at the crack of dawn to 'spiritedly' drive around the circuit before too much traffic held us up. Partners were set up at strategic bends for the photo call whilst the rest donned white scarves (wired for speed), helmets and goggles and tried not to get arrested. At breakfast we each parked our Ronart next to the luxurious yachts in Monte Carlo harbour. After the holiday several owners went their individual way back, some via Spain and others via the vineyards of France. This photograph was taken near Cannes.